Chart of the Discoveries made in 1787, in the Seas of China and Tartary by the Boussole and Astrolabe from their leaving Manilla and Arriving in Kamtschatka, Sheet II. This is a fine example of La Perouse's important 1787 mapping of the Sea of Japan and the Sea of Okhotsk. The map covers the region from the coast of southern Kamchatka south as far as northern Japan and Korea. The eastern coasts of China and Siberia, Sakhalin Island and the Kuril Islands are also covered. This map is one of the most important early surveys, exhibiting the first accurate mappings of the region by Europeans. The chart tracks La Perouse's course in the ships Boussole and Astrolabe. This particular chart notes the ships progress each day, from its arrival into the Sea of Japan on May 27, 1787, north along the coast of Chinese Tartary or the Sea of Tartary, past Hokkaido, the northernmost island of Japan, along the Kuril Islands, to their arrival in Kamtschatka (Kamchatka) on September 6, 1787. The strait between the northern part of Hokkaido and the southern part of Sakhalin is identified as the 'Strait of La Perouse,' known today by the same name. The chart includes some interesting notes including ' Yupi A people so called because they dothe themselves with the skins of Fish' and Ketchen a nation that has a peculiar language called Fiatta.' The sea between Japan and Korea, whose name, the 'Sea of Korea,' 'East Sea,' or the 'Sea of Japan,' is here identified in favor of Japan. The chart notes several place names, especially along the coastlines, notes mountain ranges, islands and other topographical features, with elevation rendered by hachure. This chart is engraved by Neele and issued as plate no. 46 in the first English edition of G. G. and J. Robinson's Charts and Plates to La Perouse's Voyage, published in 1798. Jean François de Galaup, Comte de La Pérouse (August 23, 1741 - 1788) was a French naval officer, navigator, and explorer active in the later part of the 18th century. Born into a noble family of Albi, France, La Perouse entered the navel college of Brest at just 15. At seventeen La Perouse made his first naval voyage, a supply expedition to the fort of Louisbourg in New France. He later participated in a number of naval battles, mostly against the English, and eventually rose to the rank of Commodore. In 1782 he captured the English forts Prince of Wales and York, making a name for himself back in France. Following the British defeat at the end of the American Revolutionary War, La Perouse was appointed by Louis XVI to lead an expedition of discovery circumnavigating the globe. 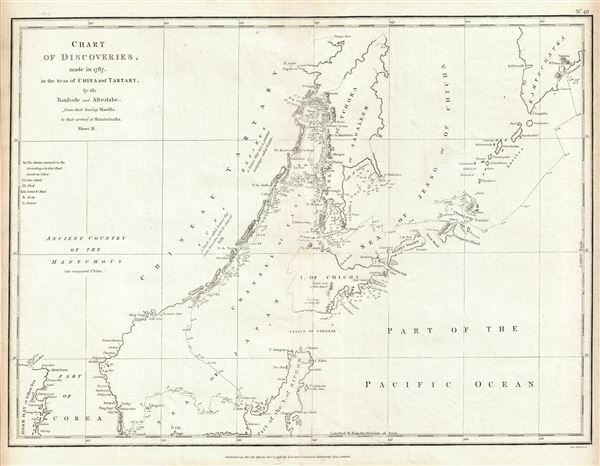 The goal of the expedition was to complete and correct the maps of the Pacific drawn by Captain Cook. La Perouse's two frigates, the Astrolabe and the Boussole rounded Cape Horn and entered the Pacific in 1785. Crisscrossing the Pacific from Macau and Japan to Alaska, Vancouver, and the Hawaiian Islands Perouse made numerous discoveries and adding considerably to the cartographic corpus, particularly along the coast of British Columbia and around Japan. In Australia La Perouse sent his last letter back to France containing all of his maps and research. Tragically, on the return voyage La Perouse ran into a violent storm which left both of his frigates shipwrecked on the Polynesian island of Vanikoro, part of the Santa Cruz Group. Some of the survivors of the shipwrecks seem to have managed to live on the island for years afterwards. As late as 1790 the English Captain Edward Edwards saw smoke signals coming from Vanikoro but foolishly declined to investigate. Expeditions in 2005 and in 2008 identified the remains of both ships and retuned numerous artifacts from the ill-fated expedition to France. The importance of La Perouse's discoveries was, unfortunately, not seriously appreciated until many years later because, when the La Perouse maps were finally published in 1797, newer more accurate maps of the region were already in circulation. Nonetheless, La Perouse remains of the titans of Pacific exploration and he work paved the path forward for all future expeditions to the region. Robinson, G. G. & J., Charts and Plates to La Perouse's Voyage, 1798. Very good. Original platemark visible. Minor toning along original centerfold. A couple of tiny wormholes in bottom margin. Blank on verso. Rumsey 0414.046. Phillips (atlases) 693.